More than 200 years after her birth and 12 years after a campaign started to recognise her achievements, a statue to nurse heroine Mary Seacole has been unveiled in London. 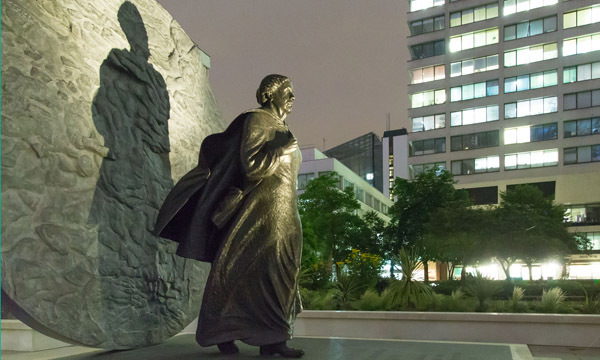 To applause and loud cheers the permanent memorial to Mrs Seacole was unveiled in the garden of St Thomas’ Hospital on the banks of the River Thames. The Jamaican-born nurse set up the British Hotel near Balaclava to provide soldiers with food and care during the Crimean War. More than £500,000 was raised for the bronze statue, created by sculptor Martin Jennings, which is the first statue to a named black woman in the UK. Guests at the private ceremony included England’s chief nursing officer Professor Jane Cummings, NHS England chief executive Simon Stevens and Baroness Floella Benjamin, who unveiled the statue. Baroness Floella Benjamin told a crowd of more than 300 people: ‘She was no ordinary human being. Mrs Seacole, who was born in 1805 and died in 1881, nursed victims of cholera outbreaks in Jamaica and Panama in the 1850s, cared for victims of a yellow fever epidemic in 1853, and supervised British Army nursing services in Jamaica. She was named the greatest black Briton in a 2004 poll. The lengthy campaign for the statue faced a number of challenges, according to Professor Elizabeth Anionwu, vice-chair of the Mary Seacole Memorial Statue Appeal. Professor Anionwu, emeritus professor of nursing at the University of West London, said a ramping up of fundraising was hampered by the recession. Construction costs also rose by £180,000 last year. Professor Anionwu said: ‘It has taken 12 and a half long years. It has probably aged us at times. A new charity, the Mary Seacole Trust, is to be established to promote the nurse’s legacy in schools and communities. A commemorative book, detailing the campaign and the creation of the statute, will also soon be available here.